And here’s our intro…Thanks for stopping by my 50th Birthday Celebration, Day 21. Blackjack! Here’s the background story: because I feel so blessed and have pretty much everything I could ever need, I am asking people to get involved with charities, if they are so inspired, in lieu of any fabulous birthday presents you were planning on sending me (or not). I am featuring a different charity every day for 50 days leading up to my 50th birthday to give you plenty of chances to get involved. I started on May 18. I wanted to give a voice to different good works around the globe. If you ARE inspired to take action, please leave me a comment and let me know that you did. This is all I want for my birthday – to spread some love and kindness. Thank you, my dear friends. I was lucky enough to interview former First Lady Rosalynn Carter once. I was so impressed by the work she told me The Carter Center was doing that I wanted to feature them here. The thing I love about the Carter Center is that they look for simple, low-tech solutions to problems. They involve local people and ask for their advice before putting programs into place, so there is a greater chance of success. For instance, there used to be millions of annual cases of Guinea Worm, a horrible and debilitating parasite. Now, partly thanks to the Carter Center’s work, there are fewer than 1,800 reported cases. 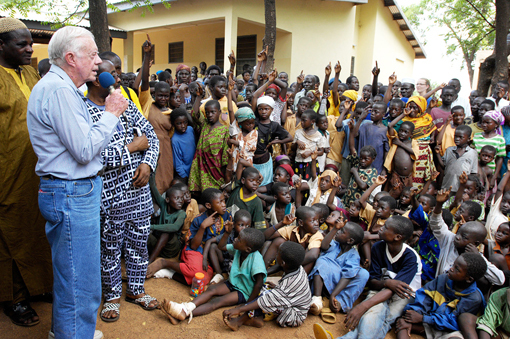 The Carter Center, in partnership with Emory University, is guided by a fundamental commitment to human rights and the alleviation of human suffering; it seeks to prevent and resolve conflicts, enhance freedom and democracy, and improve health. 1. The Center emphasizes action and results. Based on careful research and analysis, it is prepared to take timely action on important and pressing issues. 2. The Center does not duplicate the effective efforts of others. 3. The Center addresses difficult problems and recognizes the possibility of failure as an acceptable risk. 4. The Center is nonpartisan and acts as a neutral in dispute resolution activities. 5. The Center believes that people can improve their lives when provided with the necessary skills, knowledge, and access to resources. Donation Page is here. You can also send an e-card with or without a tribute donation. I love theri emphasis on asking people what they need and working with them, rather than imposing ideas from the outside. I adore the Carters and their work. I went to hear Sunday School taught by him once in Plains, maybe eight years ago? He spoke, earnestly but with gentle humor and kindness, about the simple solutions of mosquito nets. She interrupted and totally charmed as a backseat driver. Such good work they’ve done. You are amazing with your birthday days, just amazing. I know. I wish more Christians were like them – acting the teachings more than just talking about them. You can tell they have such fondness for each other. Aw…thank you. You don’t know how often I think of you!